I've just listed an exceptionally rare book on eBay: a first (english) edition of Mikhail Botvinnk's Championship Chess. It's Botvinnik's first book and he reportedly spent 3 years writing it. It covers the 1941 match-tournament for the championship of the USSR: the 3 years' dedication is evident in the depth of his annotations to the games. I'd intended to list the copy a while ago; I'd spent a lot on it, but knew its value. However, as I prepared the listing I noticed there was a 'scribble' on one of the inner pages below a dedication to his brother who'd been killed in the Battle of Leningrad. 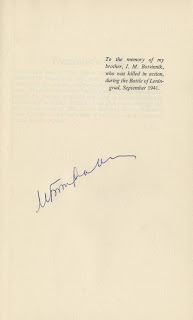 At first I thought the 'scribble' was a previous owner testing his biro, but then it struck me: maybe my rare book was actually signed by Botvinnik. Thankfully, the Internet quickly gave me the answer, and sure enough my 'scribble' matched the few examples of Botvinnik's signature that are available. My rare book suddenly became exceptional. 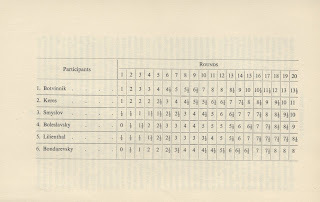 As for the tournament itself, Botvinnik won the six player (4 games against each opponent) event from a magnificent field of Keres, Smyslov, Bondarevsky, Boleslavsky and Lilienthal.